The area encompassing the Town of Brighton was originally settled in the late 1700’s and was formally established as a Town in 1814. Named for Brighton, England, it remained a farming and brick-making community until the 20th century, when the town began its evolution into an upscale suburban residential area. In the 1800’s Brighton became known as the brick industry capital of Upstate New. You can still find many well preserved 19th century brick homes today, including the Stone Tolan House built in 1792, which is also the oldest landmark in Monroe. Established in 1822, the Town of Chili originated as part of the Town of Riga. There are two theories on how the Town got its name: one theory is that the Town was named after the country of Chile, which was fighting for independence at the time; the second theory is that the Town was named after the Chiliast religion which was the religion of some of the earliest settlers in the South Chili area. Chili is home to Roberts Wesleyan College, which was the first educational institution established for Free Methodists in North America. Chili’s twin town is the Italian coastal city of Agropilo. General Matthew Clarkson was an extensive landowner in this locality, who gave 100 acres to form the Town of Clarkson. General Clarkson served in the Revolutionary War and went on to become Secretary of War, U.S. Marshall, and won election as a State Senator. It served as the meeting point for troops and storage location for supplies and ammunition. The Town proved to be of importance during the War of 1812 by becoming a stopping-place where horses were changed and travelers were allowed to rest. Originally known as Despatch, and renamed in 1906, East Rochester was a planned community designed around the New York Central Railroad mainline that ran through the center of the village. During the 1970’s and 1980’s, the East Rochester community went through a great deal of change for their community goals. The Village withdrew from the Towns of Pittsford and Perinton and formed the Town/Village of East Rochester, one of three co-terminus communities in New York State. The Town of Gates was named after the American Revolutionary General Horatio Gates and is the geographical center of Monroe County. The population has grown to over 29,000 residents, including two home town celebrities - rock legend Lou Gramm of Foreigner, and former Baltimore Orioles Manager Joe Altobelli. The Town is also home to unique recreational facilities such as the indoor fields at Total Sports Experience and Cinemark’s IMAX theatre. Formerly known as Northampton, the Town of Greece was established by the New York State Legislature on March 22, 1822. The name Greece was chosen because of the wave of sympathy toward the Greeks who were then fighting for their independence. The town has been through many transitions, and what was once a community based on agriculture, became a bustling metro with the emergence of Eastman Kodak as a major industrial employer. With a population of nearly 100,000, Greece is the largest Town in Monroe County. The Town of Hamlin received its name in 1861, in honor of Hannibal Hamlin, President Lincoln's first Vice-President. Hamlin is Monroe County’s second largest town with a land area of 44.4 square miles. It occupies the northwest corner of Monroe County and was initially a part of the town of Northampton. Swamps, thickly forested area, and its remote location resulted in Hamlin being the last of Monroe County's towns to be permanently settled. Agriculture has always been a key element of Hamlin’s community, from the early days of small farms to more modern commercial agriculture that we see today. In 1790, Robert Morris sent William Temple Franklin, the son of Benjamin Franklin, to England to seek buyers for land in western New York. The Town was named after Henrietta Pulteney, daughter of one the major investors in the township. With the opening of the Erie Canal in 1825, Henrietta farmers gained access to the New York City market for their crops and the town prospered. In 1826, residents opened the Monroe Academy, the first incorporated school in Monroe County. In the 10 years following World War II, the population of Henrietta grew from 3,000 to approximately 14,000 as people started moving to the Rochester suburbs. With the completion of Interstate 390 and the building of Marketplace Mall, Henrietta developed into one of the major retail shopping destinations in Monroe County. When the Town of Irondequoit was founded in 1839, three quarters of the land was still untouched. By the end of the century it became known as the garden spot of western New York and in the late 1800’s after Sea Breeze was built, the area became known as the "Coney Island of Western New York." Cal Ripken Sr., former Rochester Red Wings Manger and father of baseball legend Cal Ripken Jr., lived in the Seabreeze neighborhood with his family for several years while coaching the Red Wings. The Town of Mendon was established in 1813 when the first town meeting was held in April of that year. It is believed that the Town was named by one of its first settlers, Caleb Taft, who originated in Mendon, Massachusetts. A great number of Mendon’s early settlers came to the area from Connecticut, Massachusetts, and Vermont. The Town began as part of Ontario County and in 1821 was annexed to Monroe County when it was founded. Mendon covers approximately 39 square miles and has over 9,100 residents, including professional hockey player Ryan Callahan of the Tampa Bay Lightning. The Town of Ogden is located along the Erie Canal and was founded in 1817. Like many other Towns in the area, Ogden has a long history of farming, and is home to one of the oldest family farms in New York State. Colby Homestead Farms has been operated by the Colby family for more than 200 years and is still producing significant crops. Several farm markets, including Whittier Fruit Farm and Robb's Fruit Farm, operate during the year and sell fresh, seasonal produce. Ogden is also the home to several lift bridges that span the Erie Canal. These bridges were built during the reconstruction of the Erie Canal in the early 1900s. Legislation creating the Town of Parma was passed by the New York State Legislature in 1808, but the Town did not officially form until 1809. Named after Parma, Italy, the Town covers over 42 square miles and is home to over 15,000 residents, including two time gold medalist Cathy Turner. The Octagon Cottage on Bogus Point at Lighthouse Beach is a very unique piece of architecture that calls Parma home. Built by a local artist, B. Aylesworth Haines, it is the only octagon cottage on the south shore of Lake Ontario. The land now known as the Town of Penfield was purchased by Daniel Penfield in 1795. In an effort to encourage settlers to relocate to his area and turn it into a booming flour milling community, Daniel accepted wheat and other farm products as payment until settlers became more established. The Daisy Flour Mill, located on Blossom Road was where they produced flour and grain products until 1972. Penfield’s town motto is the “Town of Planned Progress,” and is home to over 36,000 people. The area known as Perinton was originally settled in 1788, but did not become an official town until 1812, when it was established by the New York State Legislature. The Town of Perinton is home to the Village of Fairport, which became a booming canal town in the late 1820s. While the area now known as Fairport flourished, the rest of the Town remained mostly rural until the 1950s. Today, Perinton is a hometown destination for individuals and families seeking a high quality of life. The Town has twice been cited as a "Top 100 Best Place to Live in America”. The Town of Pittsford received its name for Colonel Caleb Hopkins, Pittsford’s first Town Supervisor and hero from the War of 1812. Although industry was never the Town’s strong suit, it was once home to a thriving Pickle Factory and the Pittsford Milling Company flourished during World War II. The Town of Pittsford is home to Oak Hill Country Club, which hosted the PGA Championship in 2013 and many other major golf events, including the Ryder Cup and United States Open. Pittsford is also home to St. John Fisher College, which hosts the Buffalo Bills’ annual summer training camp. Many famous and notable people have ties to Pittsford including soccer-star Abby Wambach, model and actor Tyson Beckford, and 2012 Olympic Bronze Medalist Henrik Rummel. The Town of Riga was formed in 1808 when the Town of Northampton was divided. Originally East and West Pultney, named after Sir William Pultney, Riga has a rich culture with Native Americans and some of the first Revolutionaries. In 1808, Riga divided even further when East Riga became the Town of Chili. Riga is home to the Village of Churchville, named after Samuel Church, who connected the Town of Riga to the developing City Rochester by building roads and pathways. Riga is home to an 1850’s house that was a stop on the Underground Railroad for slaves making their way North, owned and supported by John and Jane McGuffie. Riga is also home to Jenn Suhr, an Olympics Gold Medalist and top ranked Pole Vaulter in America. In 1803, Colonel Nathaniel Rochester, William Fitzhugh, and Charles Carroll purchased 100 acres of land later to be called Rochesterville for $1,750. In 1825, shortly after the Erie Canal was established, Rochester experienced a population boom. During the 1800’s Rochester became home to historical figures such as Frederick Douglass and Susan B. Anthony. The invention of the Kodak camera in 1850 influenced more manufacturing jobs, and the city which was once known as the flour city began to bustle with new commerce. Rochester is also the home of the University of Rochester, which is currently the region’s largest employer. Much of George Eastman’s estate was left to the school and the Eastman Museum, which is a major player in Rochester’s vibrant and lasting Arts and Culture sector. On April 10, 1962, the nation’s first urban indoor shopping mall opened in downtown Rochester. As of 2013, Rochester remains the third largest city in New York State with a population of over 210,000. Some believe the Town of Rush was named after the rushes growing along the creek, while others believe it was named after Dr. Benjamin Rush, Founding Father of the United States. Dr. Rush was a civic leader in Philadelphia, where he was a physician, politician, social reformer, educator and humanitarian, as well as the founder of Dickinson College in Carlisle, Pennsylvania. The Town of Rush has a rich transportation history dating backing the rise of the railroad industry and is currently home to the New York Museum of Transportation and the Rochester & Genesee Valley Railroad Museum. The Town of Sweden was formed in 1814 following the split of Genesee County. The Village of Brockport was founded within Sweden and is home to The College of Brockport. 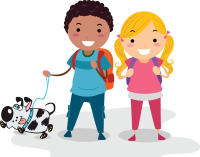 Over the past 200 years, the Town of Sweden was made successful for its accomplishments in agriculture, education, recreation, and community service. The Town of Webster was named after former Congressman, United States Senator and Secretary of State, Daniel Webster. 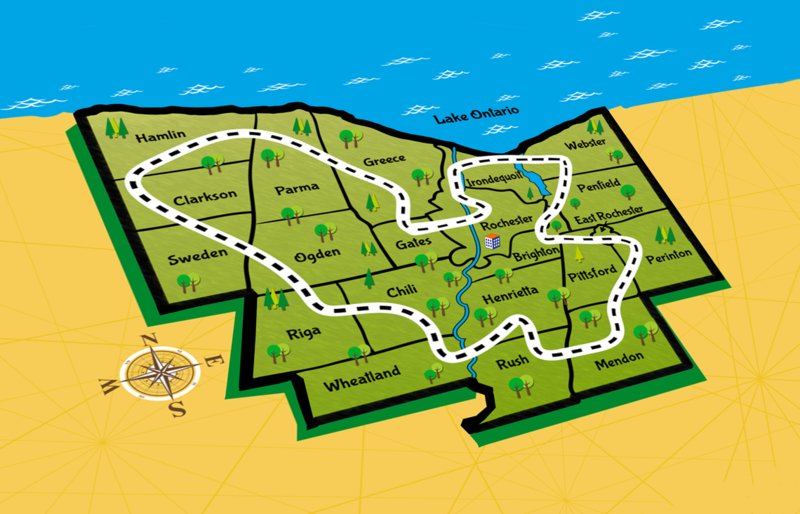 The Town’s motto: “Where Life is Worth Living,” speaks to the high quality of life available to residents through its breathtaking views of Lake Ontario, easy access to numerous parks and hiking trails, and a first-class library system, which features a children’s library that was constructed to look like a park and playground. Brian Bliss, former player for the USA Men’s National Soccer Team and Coach of the MLS Kansas City Wizards was born in Webster and graduated from Webster Schroder High School. The first settlers arrived circa 1789 and the town was established in February 1821 as Inverness. On April 3, 1821, the state legislature changed the town's name to Wheatland, allegedly at the behest of John Garbutt, a former Town Supervisor and New York State Assemblyman. There are several hamlets in the Town of Wheatland including Garbutt, Mumford, and Belcoda. Mumford used to be known as “McKenzies Corners,” named after one of the owners of the first mill built there, “Slab City,” because of the materials used for the first houses, “Mumfordville” after a prominent citizen, and eventually Mumford. Wheatland also serves as home to the Village of Scottsville, where a gristmill was established and became the first Rochester industry. 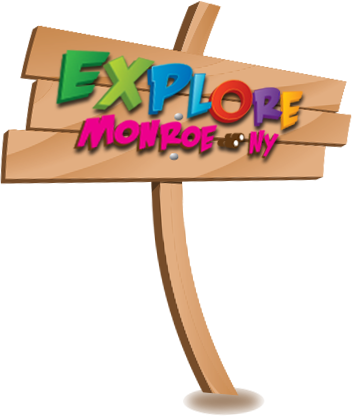 If you go to an event or location and are unable to find the code please email us at exploremonroe@monroecounty.gov to make sure you get credit!